With Friday’s rest day going by rather quickly for 8 of the teams at the 2014 FIBA World Cup, there was very little time to rest or draw breath. With the final being a week away (held on Sunday the 14th of September), there is no time to waste and another four teams have already excited the tournament since the start of the weekend. Team USA were the first team to book their place into the quarter final and while a win is always a positive thing; the nature of the win would have been a good thing for the Americans. It is not as though Mexico were stern opposition but America showed that they had learned a few lessons from the Turkish game, where they started slowly. In this match, the Americans came out firing and were up by 15 points by halftime. Eventually, the final score was 86-63 in America’s favour with Stephen Curry grabbing 20 points for USA. The fact that Gustavo Ayon netted 25 points for Mexico will be of no consolation to the losing side but they knew they were up against it with this tie. France were up by a point at half-time in their quarter-final v Croatia but a storming third quarter performance placed the French side way out in front of their counterparts. There was a late push by Croatia, who pulled back 7 points in the final quarter, but it wasn’t enough with France holding on to win by 69-64. Bojan Bogdanovic delivered another stunning point scoring display for Croatia with 27 points, but it wasn’t enough to turn things around and you can bet that France’s top point’s scorer, Thomas Heurtel with 18 points, was a lot happier with his efforts than Bojan was. Slovenia booked a game against tournament favourites USA, which the Basketball Betting crew will attend, with a win over the Dominican Republic. It was a fairly even contest which was shown by the fact that the initial quarter was tied at 15-15. Slovenia took a lead by half time but with the Dominican Republic storming back in the third quarter; it was all set for a storming finale. The bookmaker’s favourites for the tie came through in the and at the end of the match; the score was 71-61 in favour of Slovenia. Both teams have a top scorer of 18 points in the game. The Dominican Republic top scorer was James Feldeine while Slovenia were boosted by the point scoring of Zoran Dragic. To the surprise of no one, Spain were in control of their match against Angola from pretty much the start of the game. Spain won every quarter and ran out 89-56 winners in the end with Pau Gasol continuing his fine run of form in the 2014 FIBA World Cup, scoring 17 points. Clearly the bookmakers were spot on with their expectations for the first day of last 16 games as all four of their favourites won through. The USA v Slovenia games takes place on the 9th of September in Barcelona while Spain and France clash a day later on the 10th of September in Madrid. The other two quarter final games will be decided on Sunday, which means that before the weekend is out, we will know the final 8 teams of the FIBA World Cup in 2014. Compared to the games played on Saturday, there appears to be fewer mismatches in the games lined up for Sunday. Yes, there are favourites in all of the four games but nothing like the ridiculous odds that were on offer on the first day of the round of last 16. According to Bwin, Lithuania are the most certain team to win on Sunday as they are available with odds of 1.18 while their opponents New Zealand have odds of 4.75 to reach the quarter final. 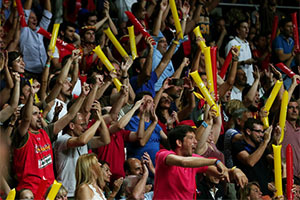 Greece are the favourites to overcome Serbia, with the Greeks listed at 1.50 while Serbia hold odds of 2.55. Australia are tipped to continue through, justifying their efforts in coming third in their group, as Bwin lists them as 1.60 to beat Turkey, while the Turkish side is listed at 2.30. In the battle of the South American sides, Brazil are the favourites with odds of 1.35 while Argentina have odds of 3.10 to make it through to the next round. These games will also provide the teams for the two remaining games of the games in the quarter-final. In the top half of the draw, the winner of the Serbia v Greece game will play the winner of the Brazil v Argentina game. According to Bwin odds, this will see Greece take on Brazil in the quarter finals. In the bottom half of the draw, the winner of the New Zealand v Lithuania game will take on the winner of the Turkey v Australia game. If the bookmaker odds are to be believed, we will Lithuania take on Australia, which was a group game. In that one, Australia pulled off a big result and if these two teams do clash again in the quarter final, it will be a big match. Will Australia hold the psychological advantage or will Lithuania find that revenge is a far sweeter dish? With four teams in the quarter finals and four more to come along, any chances of this being a lazy Sunday are out of the window. Our recommended online basketball betting sites think that these four games are going to be quite exciting, so make sure you are in line to bet and watch as the 2014 FIBA World Cup continues.